After two years of the "rebirth" of one of the representative manifestations of international “vespismo”, Vespa Club Mantova organized the 11th edition of the "1000 Km Vespistica”, on 24 and 25 May 2013, under the aegis of Vespa Club of Italy, with the collaboration of Vespa World Club, Historical Register Vespa, ASI (Italian Sports Alliance) and sponsored by the City of Mantua. The route, carefully designed by the organizing committee, included the transit on the eastern shore of Garda Lake, the passing of Passo Rolle of the Dolomites (1984 m above sea level), the passage along the coast of the Adriatic Sea to Ravenna; stopping in the night guests of Vespa Museum Pascoli, the Apennine pass Muraglione (907 m above sea level), reaching the Piaggio Museum in Pontedera, the Tyrrhenian Sea and finally, after the Apennine pass of Cisa (1041 m above sea level), return to Mantova. It was supposed to be an edition "unforgettable" due to the scenic wonders of the route, but it became an "epic" edition because of the prohibitive and adverse weather condition, in which Vespa and their riders had to fight, for almost the entire duration of the path, against water, cold, hail and snow. Reading "Epic Edition" of "valiant Vespa", the "resounding victory" and "hard battle" might suggest an exalted reporter: some of the faces of the riders on arrival told that will and passion would not be enough to push them to finish the 1006 km of the route. Words were not necessary to describe the experience lived by riders in the two days of competition: it was enough to linger on the expression of their faces on arrival to understand that what for many of them was important before departure, (to arrive to say I was there), turned into something more: to succeed in order to overcome a challenge with themselves. For those who have shown so much passion and tenacity, reverence and respect are proper. 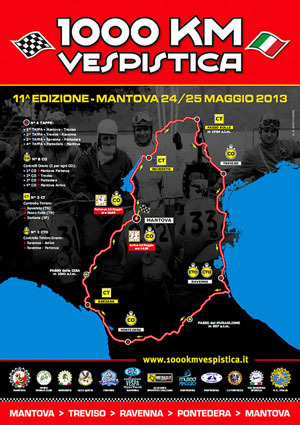 At the end, 193 Vespa transited at the finish line of Mantova, of the 297 that started off, reporting a resounding victory, proving once again that the determination, passion and tenacity, can help to win even the toughest battles. It must be added that of these, only 148 were able to stay within the assigned timeframe. Even more striking for the category of the Vespa faro basso (1947-1953) in which there were 23 members and 9 saw the finish line; for these riders, riding vehicles built over fifty years ago, having finished the race really took on the characteristics of a challenge and an adventure that will go down in the history of modern vespismo. Turning then look at the statistics, we can say that the 1000 km of bad weather edition just concluded, broke a previous record. In 1953 750 km were covered battling bad weather: of 374 riders that had started off, 312 crossed the finish line. But the 2013 is not only a guinness for bad weather, it is especially for registered: 306 members, 69 Vespa Club national and European, with the presence of an American, 20 participants from Austria / Belgium / Germania / Francia / S.Marino / USA, 7 Ladies - pink Vespa, 31 8” wheels, 250 10" wheels and 16 automatic Vespa. These are important data: data growing in a period in which the economic crisis do not help the manifestation. These data drive us to work with even more enthusiasm and all the energy given is gratifying, to rekindle that desire dormant for over 40 years to re-experience an event that was still in the hearts of many Vespa riders. Thinking of having more than 300 members in the 11th edition was a beautiful dream, but to be able to do them in just 48 hours was a bolt from the blue. The biggest thanks goes of course to all Vespa riders who, by their presence and participation, have enhanced the success of the challenge: we are waiting for you with open arms for the 2015 edition, because we are sure that with you we can do great things in the saddle of our trusty steed, the beloved Vespa. From early afternoon, the setting up of Piazza Sordello began by the members of the Vespa Club Mantova and various collaborators, with an almost summer weather. At sunset it appeared fully decked "to the nines" for the occasion with banners flags, platform base, gazebo for timekeepers and sponsors. Everything was ready for the big event, with many Vespa riders already arrived for the accreditation and withdrawal of the material of the race. Everything perfect until 11 p.m. when a strong storm raged and damaged much of the stands and tore off gazebo, forcing the organizers to work late into the night for the safety of the square. • Friday, May 24 - Here we go! The morning of departure, under a leaden sky in a succession of pouring rain, Piazza Sordello looked almost like a battlefield with gusts of wind that tore bands of timed routes marked on the cobblestones and Vespa and riders all holed up sheltered from the rain under the portico of Palazzo Ducale. During the briefing, moving of Control time to Egna, originally planned on Passo Rolle, was formalized because of the snow, with the adoption of "variant Valsugana" instead of the pass in the Dolomites. In this "surreal" atmosphere despite the bitter awareness that the bad weather would have been a companion along the way, the 11th Edition of the "1000 Km vespistica" started off with 297 competitors at the start of the 306 registered. After the starting time trial , which has suffered many problems because of gusts of wind not very compatible with the photocells, and the passage of rite on the platform for a souvenir photo with ... umbrella, the Vespa started to reach the east shore of Garda Lake. In Rovereto, the first stamp control in the beautiful setting of the MART (Museum of Modern Art). Short stop for refreshment with the "packed lunch" courtesy of the Vespa Club Rovereto, a sip of hot tea and right away along the Adige Valley until Egna. Second CT and welcome of the Vespa Club Alta Quota (moving from Moena as a result of the modification of the route) which has welcomed riders with tastings of delicious specialties. A brief stop was imposed by prudence because the weather conditions were deteriorating rapidly and began to snow; riders started to face the descent of Floriana Valley to reach SS 47 of Val Sugana and then Treviso for CO provided by the roadmap. Unfortunately torrential rain, fog and cold followed the riders who have reached the CO of Treviso upste and wet to the marrow at darkening. Chaotic traffic and a not very good "location" have greatly complicate lives of shivering riders who tried to reach the area in useful timed. The awareness of not having the right equipment to go on, a bit of discouragement due to the difficulties encountered and perhaps the lack of physical and mental preparation of several riders were the cause of their abandonment: not even the warmth and welcome of members of Vespa Club Treviso have managed to convince them to continue and .... so the first withdrawals began. The way to go, before to get to the desired grouping of Ravenna, was still so much; so.... back in the saddle! As often it happens, nature sometimes is harsh and it seems to rage on rider, in an instant can be forgiven: the lagoon that runs along the Via Romea a wonderful full moon who accompanied the troops to Ravenna appeared in the clouds, first timidly then in "stadium lighting". With the moon, the rain has finally granted a rest, and so, with a little more raised spirits, the CTO at the Museum Pascoli was finally reached. Welcomed in the gallery of the Museum, with the bar and the services available, riders were finally able to enjoy a deserved rest. Just time to close eyes and here it is: at the dawn the caravan back to life. At 4.30 am 8” wheels restarts and 6.00am 10" one. The route to be followed leads to Passo del Muraglione and a breathtaking show was presented to riders: opposite the moon sets and the sun rising behind. Unfortunately, the break granted by bad weather lasted very little: time to begin the descent towards Florence and ... hell raged again. Another storm fell on competitors while gusts of wind have put in serious difficulty balance of the Vespa riders who have had to reduce speed to avoid being thrown from the saddle. All this went on until Pontedera, where in Viale Rinaldo Piaggio - in front of the Piaggio Museum - was held the third time trial. For those who were not too late on schedule imposed, there was the opportunity to enjoy the hospitality of the Piaggio who opened the doors of the Museum to riders; among the Vespa exposed, they could refresh themselves with a hot rich breakfast. Many riders quitted food, preferring instead the services, thanks to the presence of a hairdryer to bring back hands and rest of the body to a survival temperature. Riders restarted toward Sarzana, with already in mind the difficulties they would encounter on the Passo della Cisa. The restart from Pontedera was again marked by rain that increased in intensity until it became hail; grains, as big as hazelnuts, hit on the riders whitening the roads and making them even more slippery. In Sarzana a ray of sun appeared through the clouds that still does not foretell nothing well: in fact, from the first hairpin turns of the Passo della Cisa until the end of the descent towards Parma, first water then snow and fog were still unwelcome trip companions. The last few miles of road passed with the obsessive thought that the unexpected could spoil the party, that the fall due to tiredness that exhausting days and when even the discouragement seemed to take over ... finally in the distance Mantova appeared. The arrival in Piazza Sordello at the conclusion of this 1000 km remain for all riders an emotion hard to forget. The award ceremony was held during the gala dinner as usual, which was almost a summer day this year, in the beautiful setting of Villa Peron, near Mantova in the presence of riders, organizers, collaborate and authorities. A heart-felt thanks, really heart-felt, to veterans of the 1000 Km Antonio Zin, Piero Ravelli, Gianfranco Montaldi, Giorgio Goffi and Giuseppe Cau that held the inauguration of this 11th edition that was honored by their presence even at Gala Dinner. The Trophy Audax was deservedly won by Elvezio Biserni (Vespa Club Mantova), 2nd place Matteo Wegher (Vespa Club Rovereto) and 3rd place Leonardo Pilati (Vespa Club Rovereto), followed by awards for 37 other classified, awards for categories and special awards. A mention to those, who had to abandon the challenge despite the determination for various reasons (accident, lack of proper winter equipment, irreparable damage to the vehicle): understand their disappointment but the satisfaction of having been part of something unique remains and not being able to get to the bottom is an incentive to find more reasons to join the next edition. On this occasion Vespa Club Mantova want to thank the Vespa Club Italy, the Vespa World Club, the Historical Register Vespa, the ASI (Italian Sports Alliance), the city of Mantova, the Municipal Administrations of the town crossed by the event, all the clubs that have collaborated actively and very well: VC Rovereto, VC Alta Quota, VC Trentino Südtirol, VC Treviso, VC Pontedera, VC Sarzana, Pascoli Museum of Ravenna with the VC Romagna and the Piaggio Museum of Pontedera, all riders, crews of "broom wagon", all the members collaborators of Vespa Club Mantova and friends who have shared in various ways and worked actively for the success of this 11th edition of 1000 km. A big thanks with another certainty, the 12th edition of the 1000 KM VESPISTICA ... to be held in 2015. As in all stories (real ones of real life), along with the beautiful things, there are those who leave a little 'bitter taste”: some participants preferred transporting the Vespa on vans for some sections, instead of carrying out all the route on their own vehicles, mistaking the meaning of the event. In this way they saved both the engine of their vehicles and themselves, while others have played with Regulation finding in them the justification to make substantial "cuts" of the route. To those who behaved in this way, it can only be answered that they were not astute but they were just disrespectful for those who faced difficulties loyally and followed accurately the route planned by the Organizing Committee. Rest assured that this will not happen again, as the edition of 2015, will have rules and regulation much more strict, in order to reward those who respect everyone and everything with heart and passion and with that spirit that, we hoped, it was taken for granted.